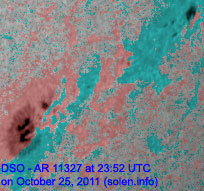 Last major update issued on October 26, 2011 at 03:25 UTC. 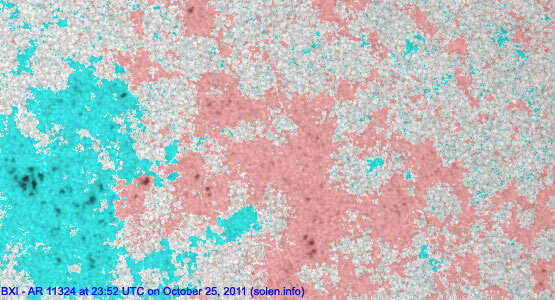 The geomagnetic field was quiet to major storm on October 25. 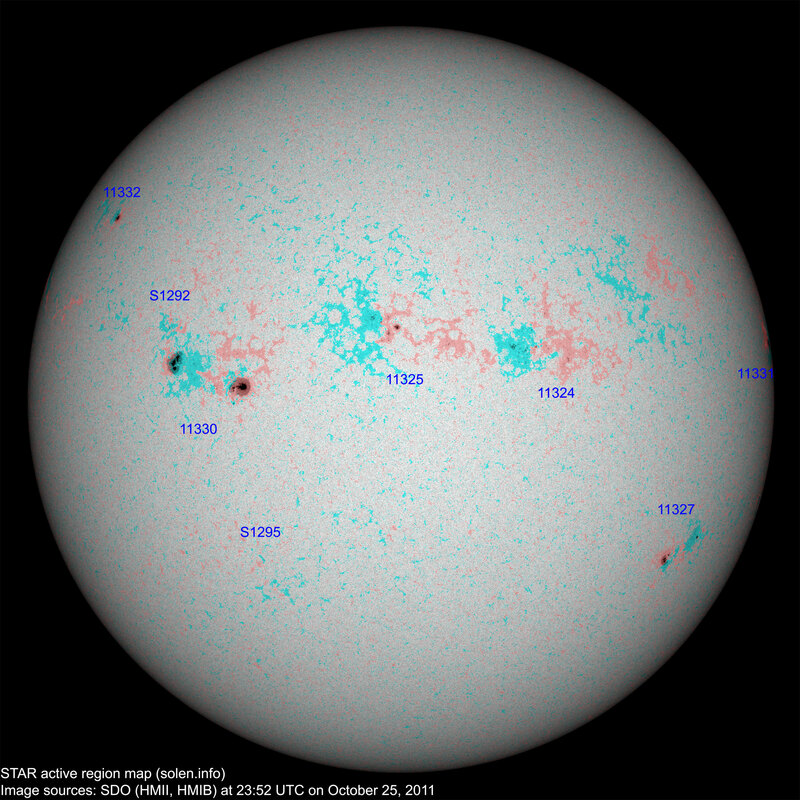 Solar wind speed ranged between 430 and 681 km/s. 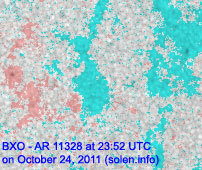 The disturbance that began on October 24 peaked between 23h on Oct.24 and 02h UTC on Oct.25 when the 3-hour planetary A index reached 132. 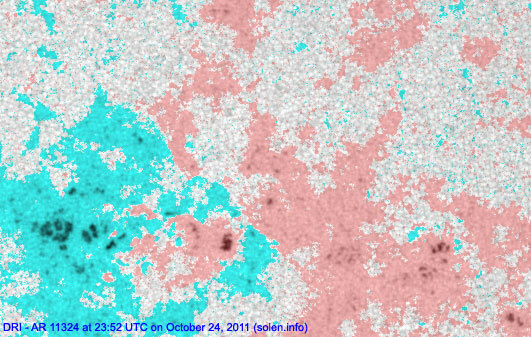 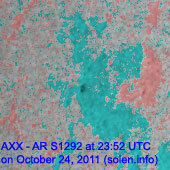 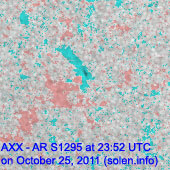 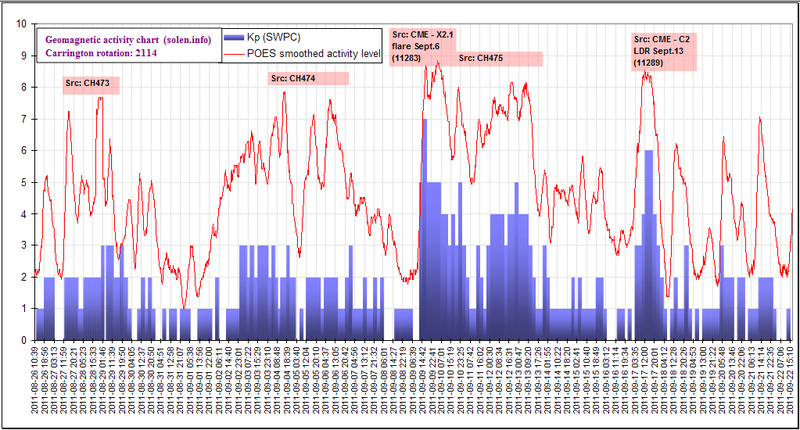 Solar flux measured at 20h UTC on 2.8 GHz was 138.8 (increasing 5.4 over the last solar rotation). 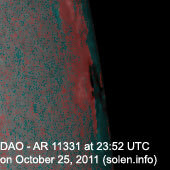 The planetary A index was 33 (STAR Ap - based on the mean of three hour interval ap indices: 33.3). 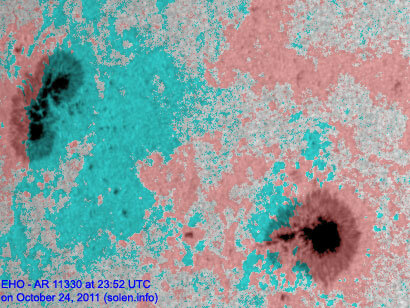 Three hour interval K indices: 66533221 (planetary), 55543222 (Boulder). 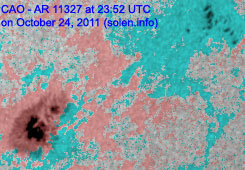 Region 11324 [N12W23] decayed further and was quiet. 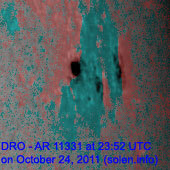 Region 11325 [N16W00] decayed slowly and quietly. 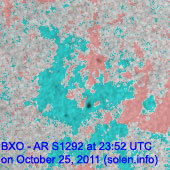 Region 11327 [S22W52] was quiet and stable. 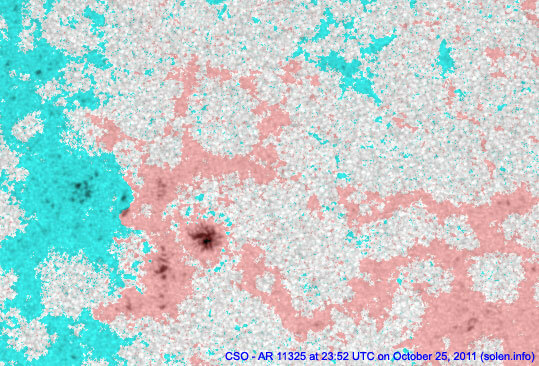 Region 11331 [N08W86] developed further as it rotated to the northwest limb. 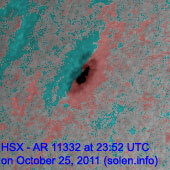 Region 11332 [N31E62] was quiet and stable. 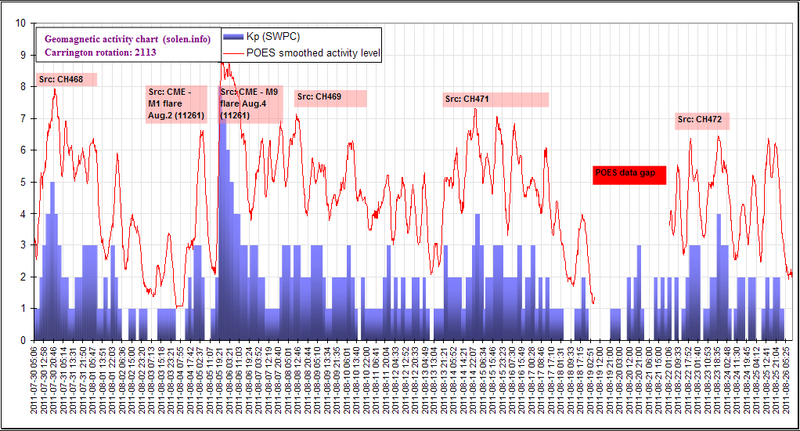 October 23-25: No obviously Earth directed CMEs observed. 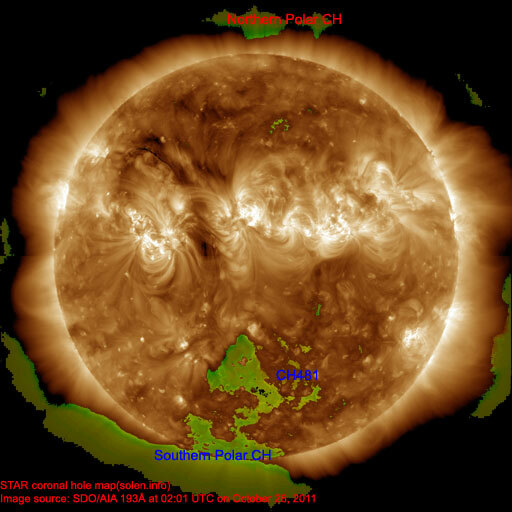 A coronal hole (CH481) in the southern hemisphere will be in an Earth facing position on October 25-26. 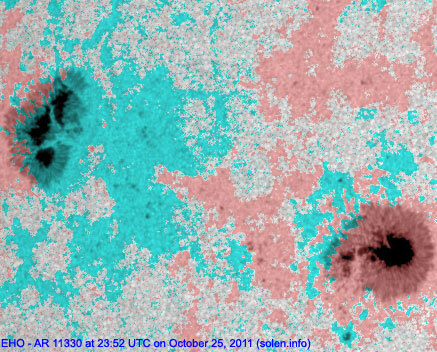 The geomagnetic field is expected to be quiet to unsettled on October 26-27. 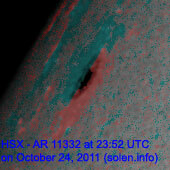 A high speed stream from CH481 could cause quiet to active conditions on October 28-29.